The Intrepid Fallen Heroes Fund serves United States military personnel experiencing the Invisible Wounds of War: Traumatic Brain Injury (TBI) and Post-Traumatic Stress (PTS). When our Servicemen and women return from the battlefield, we help them fight The War Within, by building “world class”, advanced treatment centers providing the best TBI and PTS care, enabling them to continue to serve on Active Duty and enjoy a productive life. The Intrepid Fallen Heroes Fund (IFHF) builds critically-needed centers for treating United States military personnel suffering the effects of Traumatic Brain Injury (TBI) and Post-Traumatic Stress (PTS). These injuries have severely impacted the lives of hundreds of thousands of men and women who have served selflessly in defense of our nation. To help address this urgent need, IFHF is building a series of ten specially-designed treatment facilities, called Intrepid Spirit Centers, on military bases across the nation. These centers act as Gymnasiums For The Brain, providing service members with the most advanced care available to address the complex symptoms of TBI and PTS. Seven Intrepid Spirit Centers are open and serving America’s brave men and women in uniform. More than 90% of patients treated in the centers are able to continue on Active Duty. Three additional centers remain to be built. The Intrepid Spirit Center program is only the latest in the Intrepid Fallen Heroes Fund’s almost 20-year history of assisting America’s military community. Since 2000, IFHF has provided over $200 million in support for severely wounded military personnel and families of military personnel lost in service to our nation. Today, IFHF is engaged in a critical program to help military personnel suffering the effects of Traumatic Brain Injury and Post-Traumatic Stress. IFHF is building a series of ten Intrepid Spirit Centers that provide the most advanced and effective care to these wounded heroes, allowing more than 90% of them to continue on Active Duty and enjoy a full life. From 2000 to 2005, IFHF provided close to $20 million to families of United States and British military personnel lost in performance of their duty, most in service in Iraq and Afghanistan. In January 2007, IFHF completed construction of the Center for the Intrepid, a $55 million, world-class rehabilitation center providing treatment for service members suffering amputations, limb trauma and severe burns. Following the opening of the Center for the Intrepid, IFHF turned toward another critical issue faced by our troops: Traumatic Brain Injury and Post-Traumatic Stress. 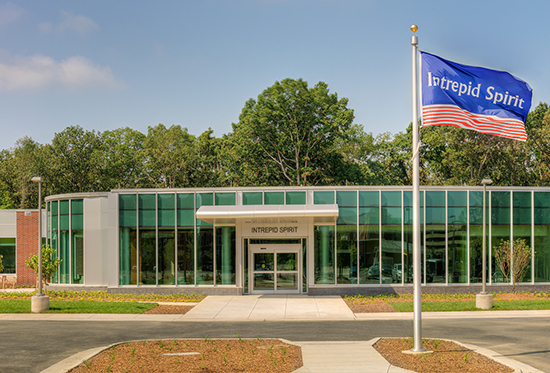 In 2010, IFHF opened the $60 million National Intrepid Center of Excellence to address this vital need. View and download additional materials about the Intrepid Fallen Heroes Fund, Intrepid Spirit Centers, National Intrepid Center of Excellence, and Center for the Intrepid. Find the answers to the most common questions we get about what we are doing at the Fund.